An unprecedented land grab is taking place around the world. Fearing future food shortages or eager to profit from them, the world’s wealthiest and most acquisitive countries, corporations, and individuals have been buying and leasing vast tracts of land around the world. The scale is astounding: parcels the size of small countries are being gobbled up across the plains of Africa, the paddy fields of Southeast Asia, the jungles of South America, and the prairies of Eastern Europe. 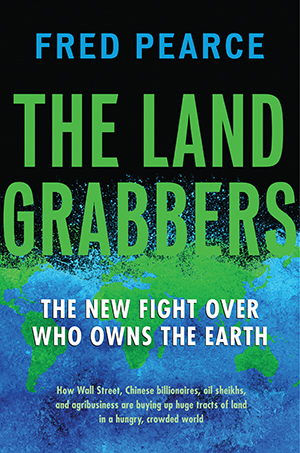 In The Land Grabbers, veteran journalist Fred Pearce presents a first-of-its-kind expose that reveals the scale and the human costs of the land grab, one of the most profound ethical, environmental, and economic issues facing the globalized world in the twenty-first century. Over the next few decades, land grabbing may matter more, to more of the planet’s people, than even climate change. It will affect who eats and who does not, who gets richer and who gets poorer, and whether agrarian societies can exist outside corporate control. It is the new battle over who owns the planet. I found an evangelical American ex¬±prison boss draining bogs on the shores of Lake Victoria; a dapper English banker plowing up the Brazilian cerrado grasslands; Saudi sheikhs in Sudan, extending the world’s largest sugar farm; the Moonies seeking “heavenly life” by grabbing Paraguayan jungles; and Gaddafi’s doomed henchmen annexing black earth in Ukraine and yellow sands in Mali. The Kidmans and Windsors and Gettys and Khashoggis and Oppenheimers are in there too--and most likely you, or at least your pension fund, have a slice of the action.